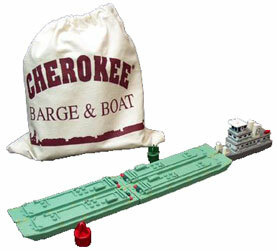 Tow sets include a boat, barges, two buoys, flotilla mat, and a canvas drawstring bag. Prices vary depending on what is ordered. You will need to call personally to recieve a price quote and place your order. 9:00am to 5:00pm Eastern Time - Monday through Friday. Each tow set includes a line boat. Just pick a stack color. $5 Charge for company colors, logo, and company name. $10 Charge for specific boat name or personal name on any boat. There are a variety of different barges in a variety of different colors. Prices vary as some are easier to make than others. Coal barges, for instance, are more work to make. That is why a coal tow costs more than a tow with mixed barges.